The AMD FirePro W4190M is a professional workstation graphics card for laptops. 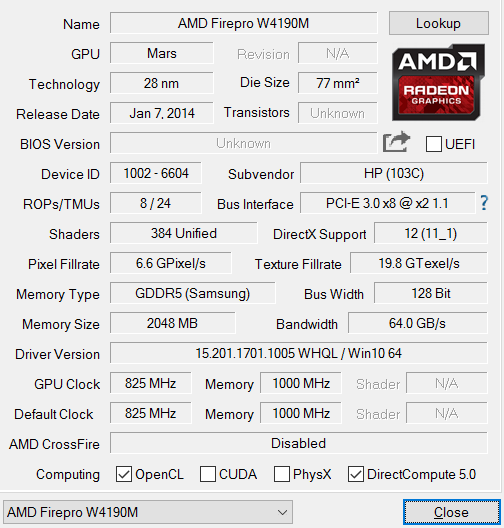 It is based on the same Mars chip as the AMD Radeon HD 8790M and AMD FirePro W4170M and similarly clocked. Therefore, the GPU takes position in the lower mid-range of mobile laptop graphics cards as of 2015. Thanks to its optimized drivers, the W4190M offers a very good performance in professional 3D applications like CAD, while the gaming performance is similar to a Nvidia GeForce 840M / Radeon HD 8790M. The AMD FirePro M4100 series is based on the GCN architecture and therefore supports DirectX 12. The 384 shader cores can also be used with OpenCL as 6 compute units.